As pharma companies continue to adopt new routes of drug administration, there has been an explosion of parenteral packaging formats: vials, syringes, dual chamber devices, cartridges and electronically-enabled devices that require extra care and precision when packing for shipment. With a focus on exceeding our customer’s expectations, our system solutions provide an unparalleled value for you. Dividella attains Sustainable Packaging Solutions by utilizing an engineered approach which addresses the entire packaging and product life cycle, not merely the package itself. Paper based engineered packages can offer significant advantages in achieving an eco-friendly and a high performance package while providing the least total cost of ownership (TCO). Parenteral characteristics, plus increasing market and product segmentation, also place ever-greater emphasis on secondary packaging, further increasing demands for packaging flexibility, precision and efficiency. 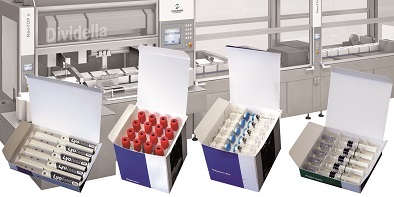 Dividella AG helps pharma industry clients stay ahead of these trends with its NeoTOP systems, a new family of modular, semi and fully automated packaging machines that are innovative, sustainable, user-friendly, environmentally aware and highly adaptable to specialised industry demands. NeoTOP loaders are ideally suited to the particular challenges posed by fragile and sensitive parenteral packs. They can be configured to specific requirements and batches of widely varying sizes and shapes. Fully automatic forming and erecting of NeoTOP partitioned carton fluted trays, NeoTOP open- top trays or NeoTOP cartons including integrated partition from flat blanks; cylindrical objects, applicators, medical devices or blisters are then laid in. The partitioned cartons, trays and packs are formed fully automatically from two supplied flat blanks. The partitions are formed and glued into the erected pack or onto the carrier blank. The products are then placed by an integrated robotic inserter. An automatic product presence checker and leaflet inserter, barcode reading systems and hot-melt unit for tamper-evident packaging complete the machine system. Leaflets fed from sheets, barcode reading system for packs and leaflet, product and leaflet presence checking system, hot foil system, labelling on the inside lid of the pack, lasercoding, inserter for booklets, integrated Robot-Inserter. The NeoTOP system that is right for your needs will depend on both the scale and pattern of your packaging operation. High-output modular packaging system: suitable for operations handling up to 24m packs per year. The NeoTOP 804 packaging line handles all lot sizes. Changeover can be carried out by two people without tools in under 45 minutes. 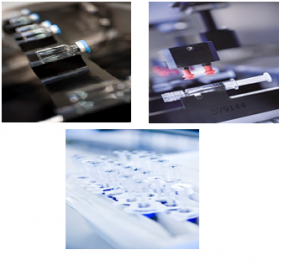 It meets all current packaging requirements with item and code checking vision systems, printing, checking of variable data and compliance with GMP guideline. NeoTOP 804 meets the needs of the high-volume sector with outputs of up to 240 packs per minute. For smaller batches, NeoTOP 804 can be operated in Single Mode, giving a peak production of 80 packs per minute. Modular packaging system for small to medium lots: suitable for operations handling up to 8m packs per year. The NeoTOP 304 uses a fully automatic process to form and erect cartons. The machine is designed for applications where high flexibility is required, such as small production lots, combination packs, and clinical trial packages. Two people can complete changeover in 10 to 30 minutes without tools. The NeoTOP 304 can handle printed or plain paperboard fluted trays, open-top trays, cartons with a top opening, re-closable lids, and multiple leaflet inserts. NeoTOP 304 offers the same range of benefits as NeoTOP 104 but adds extended availability and higher outputs of up to 33 cartons per minute. Cartoner for a manual or partially automated process: suitable for operations handling between 100,000 and 3m packs per year. Like all machines in the NeoTOP range, the NeoTOP 104 accommodates the customised feed systems demanded by the pharmaceutical industry to handle the different characteristics of parenterals and secondary packs. These allow, for example, syringes with safety devices such as backstops to be packaged or to be aligned, spread and checked before insertion into folding box. For more information on TopLoading packaging machines please contact Dividella directly.